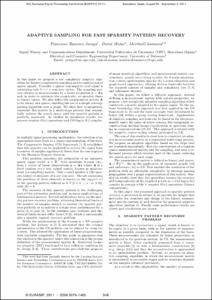 Ramirez, F.; Matas, D.; Lamarca, M.
Ramirez, F.; Matas, D.; Lamarca, M. Adaptive sampling for fast sparsity pattern recovery. A: European Signal Processing Conference. "EUSIPCO 2011: 19th European Signal Processing Conference". Barcelona: 2011, p. 348-352.